Five CSI employees, Latifah, Tina, Tony, Dana and Scott, were recently recognized and presented awards by a major client for providing Exceptional Customer Service. Client Services, Inc. (CSI) is proud to announce its sponsorship of the 2016 March of Dimes “March for Babies” program. In doing so, CSI joins the fight against premature child birth that affects 1 in 10 babies born in the United States. Premature births and birth defects are the leading causes of infant mortality. In supporting research to find out why premature births occur and find preventions to keep it from happening, the March for Babies help moms have healthy, full-term babies and spare families the frightening experience of having a baby in NICU. In 2016 to date, March for Babies has raised more than $1 Million for this very worthy cause. In June, Client Services, Inc. (CSI) was one of the sponsors of the 3rd Annual Golf Fore! Ellie fundraising event, held at the Whitmoor Country Club in St. Charles, Missouri. This annual event raises funds for the Rett Spectrum Clinic which opened in St. Louis, Missouri in 2015. Last year, the event raised $70,000.00. This year $106,000.00 was raised to help the Clinic’s efforts. Rett Syndrome is a neurological disorder which occurs almost exclusively in females. The most fundamental and debilitating aspect of Rett Syndrome is “apraxia”, meaning the inability to execute any purposeful motor movement, to coordinate thought and action. It impacts all body movement. Typically there is loss of speech and often the ability to walk. The fundraising event is named for Ellie McCool , a student who lives in St. Charles County and who graduates from high school this year. Despite Rett Syndrome, Ellie is fully integrated in regular education classes with her peers and has been a courageous ambassador of inclusion throughout her life. CSI was privileged to help raise money for the Clinic and its work with the many area children and their families affected by Rett Syndrome. As an ongoing part of our community outreach, Client Services, Inc. (CSI) is once again a participating sponsor for the Boys and Girls Clubs of St. Charles County. The need for the Boys & Girls Clubs of St. Charles County continues to grow as more youth make use of their services and assistance. The Clubs’ mission is to inspire young people to realize their full potential as productive, responsible and caring citizens by providing a place where they are encouraged to stay in school, offered help in completing their homework for the day and being prepared for school the next day. The Clubs also provide a safe environment where these young people can meet with friends, make new friends, and participate in sports and activities according to their ability or desire. How significant are the Boys and Girls Clubs to the youth who attend these programs? For many young people, after they leave school for the day, the Boys and Girls Clubs are literally their home away from home as they arrive straight from school and stay until close. In fact, if it were not for these Clubs, many of these children would go home to an empty house and have nothing to eat until they receive breakfast at school the next day. Responding to this reality, the Boys and Girls Clubs provide each child a nutritious meal before they leave for home each night. In the 2014/2015 school year, the Clubs’ After School Program served 18,578 meals and snacks to these young people. During the 2015/2016 school year, the After School Program in St. Charles County served 29,642 meals and snacks. This represents more than a 60% increase from one school year to the next! The increase in the number of meals served to these youth provides just one real world example of the importance of the work done by the Boys and Girls Clubs of St. Charles County, and why CSI is proud to once again sponsor their efforts. Client Services, Inc. (CSI) plays an important role in the transition of veterans back to civilian life through its commitment to hire veterans and their family members. On May 23rd, CSI was recognized for our continued support of the Wounded Warrior Project. The purpose of the Wounded Warrior Project is to raise awareness and enlist the public’s aid in caring for the needs of injured service members. 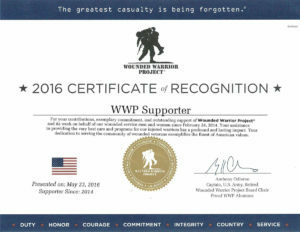 As noted in the Certificate of Recognition, CSI has been an active supporter of the Wounded Warrior Project since 2014. Also during the month of December, CSI employees from our St. Charles location coordinated a toy drive to help bring a happy holiday season to a local Crisis Nursery. We are happy to report that thanks to these efforts, over $492 and more than 7 large containers of toys were donated to this worthy charity! In honor of Veterans Day, Client Services, Inc. sponsored a luncheon for 27 veteran and active duty employees. We also held a fundraising event among our employees for the benefit of the Disabled American Veterans Association (DAVA). We are pleased to announce that because of the response of our employees, we are able to present the DAVA with a very generous donation. Thank you to all of our employees who supported this great cause and to all who serve and have served our country. Client Services, Inc. (CSI) was recently recognized as the 2014 winner of the “Delivering Positive Customer Experience” award by a nationally known client. This is the second year in a row CSI has received this prestigious award. CSI was selected based on positive customer feedback about their interaction with CSI agents. CSI led 11 other companies by a wide margin in the number of positive calls received over a 12 month time frame. Beyond this award, and due to our consistent performance, our client has awarded CSI with additional lines of business. CSI attributes its success and this most recent accomplishment to the excellence of our agents. Without great agents focused on providing outstanding customer service, this would not be possible. Congratulations on a job well done! Client Services, Inc. (CSI) has received news that our agent Gloria has been nominated by our client to their internal ACE (Achieving Customer Excellence) Award for July 2015. Congratulations to Gloria! Keep up the great work. The Client Services, Inc. (CSI) annual ‘Donate Your Weight’ competition came to a close on Friday, May 1, 2015. CSI’s twelve week event was designed not only to better our employees’ health but also raise money for two important causes. We are delighted to announce that this year the participating employees lost a total of 466 pounds. As a result, CSI will donate $250.00 to both the American Heart Association and the Juvenile Diabetes Research Foundation. The top five participants lost between 17.53% and 9.2% of their beginning weight. We would like to salute all 55 participants who made this competition so successful! CSI plans to continue this annual contest to promote employee health and support such vitally important charities!